I have done a lot of things on my birthday, from spending it in a doctor’s office to try and determine how badly my hand is broken, to cycling through the woods outside Aberdeen in Scotland. I’ve had good birthdays and bad birthdays but never, ever have I been peed on by a baby bunny. I had wanted to write a post, telling you about what I have gotten for my birthday, but instead I thought I’d put that one on hold till the end of the week and rather tell you about Joey and Matthew. They are not bunnies actually, but little tiny rabbits – by my guess about 2 weeks old, maybe as old as three but no more. They were rescued by my Other Half after their mother had been killed. Other Half shared the duty of feeding them with a friend, but unfortunately the friend is ill, and the duty fell on Other Half alone. Now, my Other Half is SuperPerson, but unfortunately, doesn’t have a lot of experience in baby animal rearing. So, when I saw them in the back of the car today, I figured that I might as well act as substitute aunt until things settled a bit in Other Half’s life. My nurturing instincts were flying through the roof, (I JUST WANT TO HOLD THEM!) and the only way to get them back in hand was to get it out of my system. So, when Other Half left, I leapt onto the internet, righted all the wrongs, and set about babysitting the bunnies. Newborn to 1 week of age: 2.5cc/ml per day. 1 to 2 week of age: 5-7cc/ml per day. 2-3 weeks of age: 7-13cc/ml per day. 3-6 weeks of age: 13-15cc/ml per day. 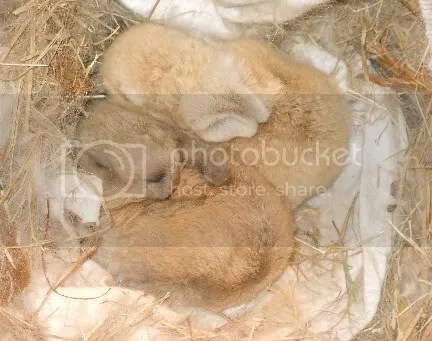 At 3 to 6 weeks, its important to start introducing your baby rabbit to oat pellets and hay (roughage) so that you can wean them at about 6 weeks of age. Pure, female hormone overload. I am way to broody for my own good. But, in general, I have to say, that of all the animals I’ve had reared (lion, chimpanzee and sheep alike…) these are (so far) the easiest to feed. Although small, it’s easy to master the technique of putting the tiny spout of the 1cc injection that I use into their mouths. If you have two, all the better, they keep each other warm! Both of them peed on me tonight. Now, some of you might find this weird but to me, it’s a great sign that they are no longer dehydrated! 😀 I like baby rabbits, even if they make me smell, lol. Some days just flow so well, like a set of traffic lights that only give you green on your journey. I have learned today that I am very fortunate and very very lucky with my friends. I love them all dearly, because they have gone to great lengths to make this day absolutely wonderful for me. I’m so glad that you had a fun “green light” day! May the rest of the year be just as good! And for your birthday I have 3 sayings of great wisdom that I have heard from very wise sources, they are: 1) Make somthing idiot proof and sombody will make a better idiot… 2) Nothing is fool proof to a sufficently talented fool… and 3) Never be afraid to try somthing new. Remember, amateurs built the ark. Professionals built the Titanic. None of these are particularly useful but I thought I’d share them anyway. Aww! They’re absolutely adorable!! I’m glad you had a great birthday, Alyss! The part about the pee made me laugh, but the sentiment behind having such a good attitude about something like that is something I have nothing but respect for.